The human body responds consciously and subconsciously to music. Outwardly, we snap fingers, tap toes, dance, sing, hum, clap to the rhythm. Inwardly, body temperature, blood pressure, breathing, and heart beat move to the music, too. A recent study indicates pregnant women respond more intensely to music than non-pregnant women and it probably has little to do with estrogen, which was the research team’s original theory. It seems an expectant mother’s intense response to music is all about developing her baby’s music appreciation. Dr. Tom Fritz, of the Max Planck Institute for Human Cognitive and Brain Sciences in Leipzig, Germany, led a team of researchers to gauge physiological responses to music in two groups of women. One group consisted of 15 pregnant women; the other 17 were not pregnant. The average age of all women was 27.2 years. The women who were not pregnant were taking oral contraceptives, making it possible to track fluctuating estrogen levels over their menstrual cycles. Each woman’s blood pressure was monitored as she listened to a variety of short musical sequences. Each sequence lasted 10 or 30 seconds. Some sequences were played forward, as the listener would anticipate, but others played the same sequence in reverse or with dissonances inserted. Dissonances are bits of clashing sounds added to make the musical sequence deliberately unpleasant. The women were asked to rate each sequence as pleasant or unpleasant. When the pregnant women liked a piece, they rated it higher than non-pregnant women who also liked it. When pregnant women didn’t like a piece, it was rated lower than non-pregnant women rated it. The pregnant women either liked it or not with a greater intensity than non-pregnant study participants. The women on oral contraceptives responded uniformly throughout their menstrual cycles, indicating estrogen fluctuations do not influence a pregnant woman’s response to music. The Fritz research team feels the woman’s exaggerated response to music is her body’s way of conditioning her baby to music perception while still in the womb. Previous studies have shown that by week 28, fetal heart rate responds when a familiar song is played. From the 35th week onward, changes of fetal movement patterns in response to music have been documented. Source: Fritz, TH, et al. 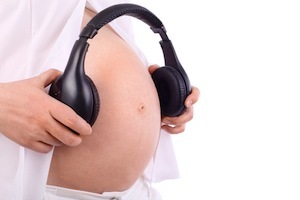 “Enhanced response to music in pregnancy.” PubMed.gov. National Center for Biotechnology Information, US National Library of Medicine. May 18, 2014. Web. Jun 25, 2014.